The gull-wing story begins in the wake of the Second World War. Through the late 1940s, Mercedes (actually Daimler-Benz at the time) survived by manufacturing re-hashes of the pre-war utilitarian sedans and trucks. It was far from glamorous but it was, at least, survival. The desire to re-emerge as one of the world's greatest car manufacturers became evident at the 1951 Frankfurt Motor Show. Here, Mercedes revealed the new 220-series sedan and the all-important 300-series luxury saloon. Although still sharing much of the basic design of earlier models, the 300-series instantly became the car of the rich and glamorous. With a finger back in the luxury pie, Mercedes turned its attention to motorsport - an arena where it had been so successful with its silver arrow cars during the '30s. Initially, Mercedes attempted to challenge the other exotic car manufacturers (such as Ferrari and Jaguar) with old 1939-design racecars that survived the war. There simply wasn't enough money to design an all-new racecar at this time. Not surprisingly, the 1939-spec cars were completely off the pace and a big engineering effort was required to be successful. Mercedes reluctantly decided to build a new vehicle to compete in the Sports Car category and, interestingly, it was Jaguar that provided direction for the design. Jaguar had won the 1951 Le Mans using nothing more than stock XK120 driveline and suspension components in a lightweight chassis – so Daimler-Benz took a similar route using its existing 300-series components. This car was to become the W194. With a target weight of less than 820kg, Daimler-Benz began the W194 project by constructing a complicated space-frame chassis. To achieve a high level of structural rigidity, deep truss sections were incorporated on each side of the passenger compartment. This resulted in a very high door sill – hence fitment of the famous vertical-opening (aka gull-wing) doors. Engineers were by now very aware of aerodynamics, so the W194's new body was designed with minimal frontal area and an efficient profile. Part of aerodynamic development involved canting the engine a massive 50 degrees to achieve a low bonnet line. Following the Jaguar formula, Mercedes used the existing M186-design engine as used in the production 300-series saloon. Displacing 3.0-litres, the engine was relabelled M194 and tuned for the 1952 race series to deliver 128kW and 256Nm (at 5200 and 4200 rpm respectively). Triple Solex down-draught carbs and a relatively high 8.0:1 compression ratio were employed, together with an aggressive camshaft profile. Numerous changes were made during the 1952 race season, including use of dry sump lubrication. The car's 4-speed manual gearbox and driveline were essentially the same as those fitted to the 300-series. 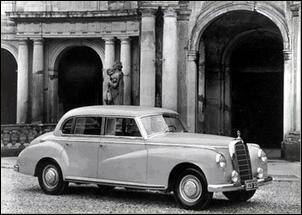 Meanwhile, the W194's brake system design was carried over from the heavier 300-series. The diameter of the drums went unchanged, but they were widened to give a total pad area of 258 square inches (1664cm2). This arrangement is said to be the pinnacle of drum brake performance at the time. Amazingly, the W194 racecar was developed in just five months! It was a monumental effort but, unfortunately, the sub-820kg goal was missed by more than 45kg. Mercedes' race drivers said they could never win without more power to offset the extra weight, but engineers were confident the car could make up for this with its handling and aerodynamics. At its first motorsport appearance the W194 was a huge success. Sure, Mercedes had enlisted some of the world's best drivers, but you can't argue with consecutive podium finishes. With barely a hint of a challenge, the W194 won the 1952 road race season. Only eleven W194s had to be built to achieve this success. Mercedes agreed to produce a road version of their race-winning design - but only after it could be thoroughly revised for its new application. This vehicle was to become the 300SL. Amongst these revisions was the remedy of major heat and noise issues, extensive body restyling (with some aluminium panels), a smaller fuel tank and attention to cargo space. The cabin was equipped with only two seats. 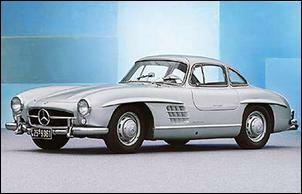 Interestingly, the 300SL was the first production car to successfully employ fuel injection. Daimler-Benz, in conjunction with Bosch and the Reich Air Ministry, had experimented with fuel injection during the Second World War. The primary aim was to eliminate fuel starvation in air combat as well as to improve performance. The 300SL used a piston-type injection pump and incorporated many of the design principles learnt when experimenting with aircraft. Huge 17-inch ram induction tubes also replaced the conventional carby-style intake manifold. Because its engine had been canted by 50-degrees, the W194 racecar suffered poor access to the spark plugs. The production 300SL uses a redesigned SOHC cylinder head with relocated spark plugs and various changes to accommodate the fuel injection system. A forged steel crank, large sodium-filled exhaust valves and a more efficient exhaust layout were also employed. Interestingly, ignition timing could also be retarded in-cabin if the driver encountered a bad batch of fuel. The result of all this was around 160kW at 5700 rpm and 280Nm of torque at 4500 rpm. This engine became the M198, but much of the architecture was still similar to the M186 found in the original 300-series. Production of the 300SL began in late 1954 and it continued until it was replaced by the 300SL Roadster (convertible) in 1957. 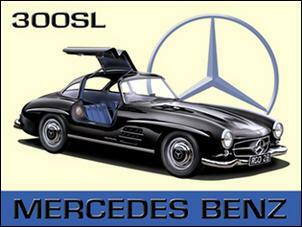 Around 1400 300SL gull-wings were built. Apparently there were numerous changes during its production span and 29 all-aluminium bodied examples were built in early 1955. These were around 80kg lighter. The 300SL was (and remains) a vehicle that people love to drive. The car does, however, have a reputation for abrupt oversteer from its "branch guidance pendulum rear axle". To some extent, this may have been sensationalised by American buyers who were more accustomed to understeer - but there's no denying that the 300SL requires a delicate touch at high speed. Theoretical top speed was 260 km/h. 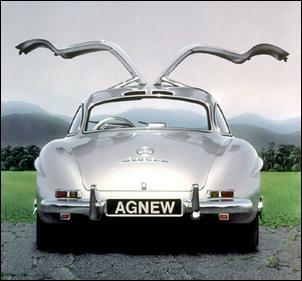 The 300SL gull-wing is also widely criticised for its awkward entry/exit – a hangover from the fact the car was never design for general use. 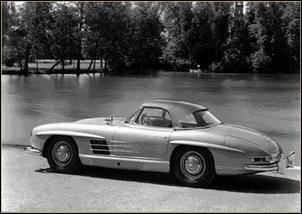 When assessed logically, the replacement for the 300SL gull-wing – the Roadster - was a better all-round vehicle. It had a much lower roll-centre, softer springs, the steering ratio was revised (from 2 to 3 turns lock-to-lock) and the side truss frames were lowered, allowing fitment of conventional side-swing doors. Engine output was increased to up to 187kW and the final drive ratio was shortened, although an extra 90kg of bulk offset any performance gain. Sales of the 300SL Roadster were limited by an unaffordable price tag – not to mention much of the gull-wing's initial impact and charisma had since passed. In just three years, one of the world's greatest cars had come – and gone. 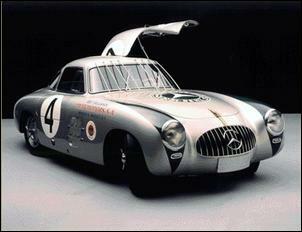 Following its 1952 Sports Car racing success with the W194, Mercedes entered Formula racing in 1953. Limited to an engine capacity of just 2.5-litres, Mercedes designed a 2.5-litre straight-eight - with a 9000 rpm redline. This extremely high engine speed was made possible by a power take-off located at the centre of the crankshaft (effectively forming two in-line fours bolted together) and an interesting desmodromic valve action. This used two cam lobes per valve - one directly above the valve that caused it to open and another that closed it via a rocker arm. This set-up eliminated valve float problems. Like its predecessor, the W196 proved to be another racing success. 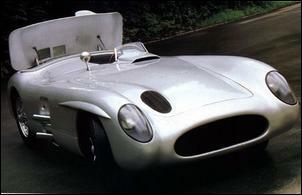 Next came the W196S (aka 300SLR), which was continued to be almost invincible throughout the 1955 season. 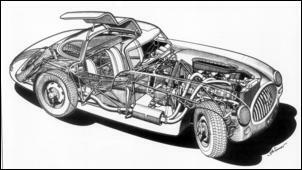 The engine was enlarged to 3.0-litres and, with a tremendous amount of power, it won every road race it entered. The only exception is the notorious 1955 LeMans, in which one of the Mercedes drivers and 80 spectators were killed in a crash. The morning following the incident Mercedes withdrew from the event and discontinued Sports Car and Formula racing. Only nine W196S racecars were built and, due to the horrific LeMans crash, only eight survive. These remain the ultimate vehicles in the series.